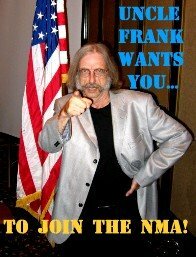 -- Glad to know that Jack Rodway will be attending the NMA reunion this year. He and his wife missed last year's get-together due to a delayed real estate closing. As I recall the story, he wound up sleeping on the bare floor in an empty house. I guess if you can sleep in a Navy rack, you can sleep anywhere. -- John Vazquez, are you coming? It's been a few years. I just saw your name listed as "attending" on the Facebook reunion page, so I was wonder--Oh. I could just ask you on Facebook. That's what it's for, I guess. -- Tex Waldron has been MIA for a while. I miss his melodious trombone-playing, particularly his subtle, golden-toned upper register. Come home, Tex we miss you. -- Speaking of Tex, a few of you other Pacific Northwest guys have been slacking off, too. Get with the program, boys. It's later than you think. I may stick my head in for a few minutes depending on my sked.